Heliopolis University Library provides students with information resources that contribute to the achievement of the university’s mission through the acquisition of a great number of books in various disciplines related to their academic study. It also provides selected books in literature, art, history, civilization, etc. The library is located in the second floor of the Student Affairs building and it is open daily from 8:00 am to 4:20 pm except Fridays and Saturdays. Reading in the library: The library provides a convenient and quiet place for all interested university students, staff members, and employees to read our selections. Borrowing: The library allows students, faculty members, and university staff to borrow books for a specific period of time. New Acquisitions Monthly Report: A monthly report of newly acquired books will be sent by email to all the library’s beneficiaries. The report includes the book’s title, author, cover, and short description. Assistance to access References: Library staff helps visitors find any required reference books or research articles needed for research projects. 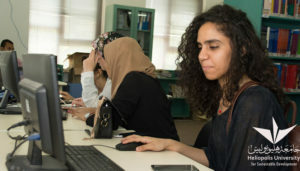 Internet Connection: A wireless internet access is offered to all library computers to help students in their online searches under its supervision. Indexing: The Library indexes and classifies its books using MARC 21 standard through the Integrated Library Management System (KOHA) to facilitate access to the library selections. In addition, library users can search for the library selections through the online Public Access Catalog (OPAC), which enables users to browse the library’s acquisitions through searching by the book’s title, author, or ISBN, reserve a book for borrowing, and learn about their previous borrowings through http://library.hu.edu.eg/.